It’s time to dig out the glad rags and check if they still fit. Suits you sir, though maybe a little tight at the waist. Madam, what is a cocktail dress anyway? 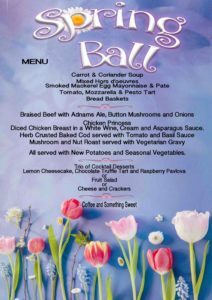 Push the boat out for the inaugural Metfield Village Hall Spring Ball. Get together with your friends and book a table. Meal worth it for the desserts alone. Disco the night away. 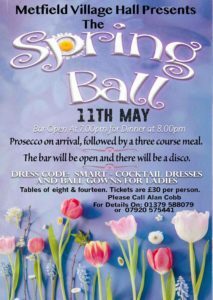 Contact Alan Cobb on 01379 588079.